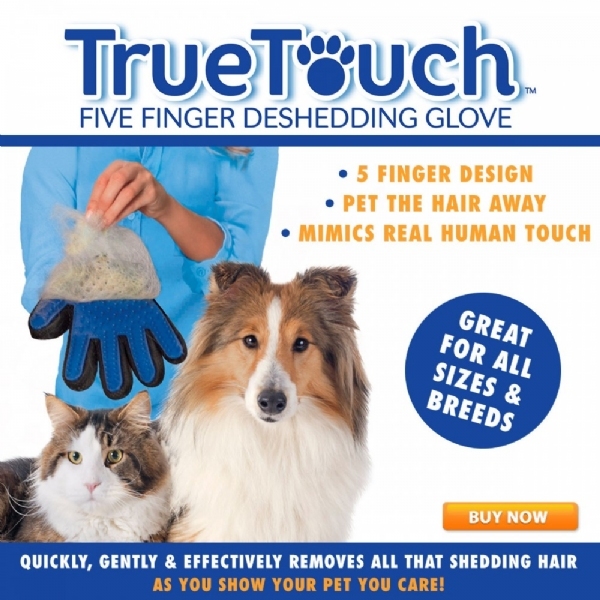 The True Touch pet glove is an amazing five-finger deshedding glove that quickly, gently and effectively removes pet fur with a massaging touch of your hand. Featuring over 175 small silicone grooming tips, the True Touch glove mimics the touch of your hand for a relaxing massage as you loosen and lift shedding hair from your pet. No more fussing with sharp brushes, tough combs and metal tools that rip, pull and tear. Simply pet, peel and throw the hair away. The revolutionary five-finger design of the True Touch as seen on TV is perfect for long, short or curly haired animals, allowing you to get deeper to those hard-to-reach areas, lifting away hair from both the top coat and the downy hair underneath. And the gentle silicone grooming tips gently massage and stimulate the skin for a shinier, healthier top coat. Minimize the mess in your home, and treat your pet to a special massage with the True Touch. My cat just loves this glove,it gets the deep down fur out and also gives him a good scratching,which he loves,it&apos;s a win-win.If you&apos;ve got shedding animals,this is your solution!